Videos in Your Journal Publishing Program? Integrating video into a journal publishing program is not new but it's also not ubiquitous across the market. Videos can be a useful component to support an individual article while also helping authors to promote their research and publications. The New England Journal of Medicine surveyed its authors and readers on the effectiveness of its Quick Take Videos (QTs). The survey experienced a 51% response rate from 95 authors and 411 readers who were contacted to share their views. Of those authors who responded, 75% replied that they were very satisfied with their role in helping to create QTs. While 17% responded they were very dissatisfied with their role in helping to create QTs. 98% of authors somewhat or strongly agreed that the QT accurately summarized their article and presented it in an engaging way. 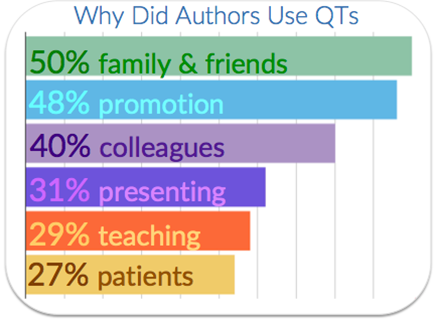 Authors shared the following reasons when asked why they use QTs. 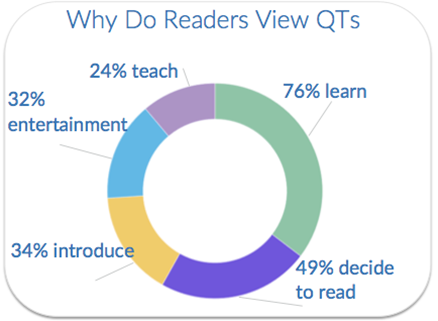 Readers shared the following reasons as relevant for why they view QTs. When asked “Do you believe that videos represent the abstract of the future," 84% responded yes. The answer to this question is where real value can be found for journal publishers. Particularly in a time when journal publishing strives to provide greater benefits to authors, offering video shorts of articles is most certainly beneficial. Are you currently integrating videos in your journal publishing program? Video abstracts? Training? Share your ideas in the comments section below. Smart Suite Version 2.0 is a cloud-based ecosystem of publishing tools that streamlines the production of high-quality content. The system has a complete interface (UI) redesign and tighter integration with high-speed production engines to solve the challenges related to multi-channel publishing. Offering a fresh approach to streamline production, the unified toolset comprises four modules that seamlessly advance content through publishing workflows while validating and maintaining mark-up language behind the scenes. Smart Edit is a pre-edit, copyedit, and conversion tool that incorporates natural language processing (NLP) and artificial intelligence (AI) to benefit publishers not only in terms of editorial quality but also better, faster markup and delivery to output channels. Smart Compose is a fully automated production engine that ingests structured output from Smart Edit and generates page proofs. Designed to work with both 3B2 and InDesign, built-in styles based on publisher specifications guarantee consistent, high-quality layouts. Smart Proof provides authors and editors with a browser-based correction tool that captures changes and allows for valid round tripping of XML. Smart Track brings everything together in one easy UI that logs content transactions. The kanban-styled UI presents a familiar workflow overview with drill-down capabilities that track issues and improve both system and individual performance. Smart Suite is fully configurable for specific publisher requirements and content types. Customized data such as taxonomic dictionaries, and industry integrations such as FundRef, GenBank, and ORCID, enhance the system based on publisher requirements. Thank you! We will be in touch momentarily to set up a demo. The Society for Scholarly Publishing celebrates its 40th Anniversary this year. To celebrate, a number of special events are scheduled to take place at the Annual Meeting. You won't want to miss this year's event. The 40th Anniversary Task Force, has also launched a new microsite for 2018 to celebrate SSP’s 40th anniversary. 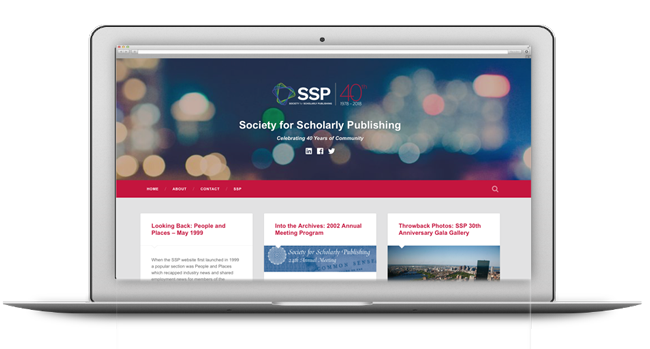 As part of a year-long celebration, the website will feature photos, documents, and news from SSP’s archives as well as interviewers with long-time members of the SSP community. The SSPat40 website is updated regularly, so you will want to check back often to browse the historical content we unveil, old photos, past topics of interest to the community. If you have any old pictures or ideas you would like to share on the website, please contact me. Finally, keep apprised of ongoing developments and share news about SSP at 40 with the hastag #SSPat40! This short video by John Bond of Riverwinds Consulting lists some of the trends he foresees in scholarly publishing this year. This post is a collaboration between SSP members, including Nicola Hill, Emma Sanders, and Adrian Stanley. On October 30th, the Society for Scholarly Publishing (SSP) hosted a regional event at the University of Pennsylvania, Van Pelt Library. The topic, "Innovative Research and Creative Outputs: From Ideas to Impact" brought together Philly-area publishers, librarians, and content professionals for a panel discussion on new and innovative methods of producing scholarship. Jen spoke about her use of Google Scholar, SketchFab and Unity in her work, which centers around the intersection of architecture and text. Using GIS (Geographic Information Systems) mapping software, Jen examines locations of historic sites. She shared an example of a mapping she did of St. Magnus Cathedral in the islands off the north coast of Scotland. In this particular example, Jen generated a binary map that indicated what would and wouldn’t be visible on the ground from a certain height. Currently, there is a lack of standards around 3D scholarly outputs—how they’re reviewed, stored, and made accessible.3D collections are siloed by institution—there is really no repository. The only exception Jen cites is Duke University’s MORPHO SOURCE. For these reasons, evaluating and citing digital work is still a challenge. Studies in Digital Heritage content are inextricably linked to the 3D model created in the course of those studies. There is a real need for community standards for 3D data presentation. Academic departments are generally slow to reward digital projects, or have a process for incorporating these scholarly outputs in formal evaluations. Archeologists with an interest in Jen’s work, for example, always want the original 3D model she created, not the version on Sketchfab. But these models haven’t been peer-reviewed, and for that reason, Jen is reluctant to provide. In the near future, more standard development and community standards for 3D and VR creation and curation in higher education is certainly warranted. Kathi Martin presented her work with The Drexel Digital Museum Project: Historic Costume Collection (digimuse)---a searchable image database comprising select fashion from historic costume collections. Initially, fashion images were highly protected by using low-res images and watermarked images on the website. Kathi explained that Polish hacktivists demonstrated to her how easy it is to remove the watermark and improve resolution. The museum has always been driven by open access and open source to share information and further usage and research. Interoperability is key to the museum’s mission—this allows the data on the museum’s website to be easily harvested across browsers. The museum has widened beyond Drexel’s collection; for example, Iris Barre Apfel’s Geoffery Beene collection was displayed and that exhibit is archived on the museum site. Quicktime VR was used to film the collection and provide high-resolution captures of the fashion collections. The technology DigiMuse is used in the Drexel project and provides a new level of engagement with the collections Kathi is preserving. Drexel's Digital Museum project website allows a site visitor to interact personally and actively with a distributed, collected narrative. The site includes rich metadata descriptions for every picture. The variety of contributions on the site, Kathi feels, stimulate varying and often deeply personal reactions. She believes the site is very powerful due to its “baked-in connectedness.” Kathi closed with Grace Kelly’s gown, made by Givenchy in part out of actual coral (gasp!). The site complements the high-res images of the gown itself with media of Grace Kelly in the gown. Alex discussed how JSTOR Labs applies methods and tools from digital scholarship to create tools for researchers, teachers, and students "that are immediately useful – and a little bit magical." JSTOR is a member of ITHAKA, a non-profit devoted to digital sustainability. Alex works with a team of five on innovative projects that benefit humanities scholars. He demonstrated JSTOR Labs’ Understanding Shakespeare tool, which uses the Folger Shakespeare Library’s digital version of Shakespeare plays to hyperlink each line of the play to a search showing all JSTOR articles that contain a particular line of prose. JSTOR Labs works from a philosophy of play—Alex sees what resources other organizations (like Folger Shakespeare Library) bring, what LABS brings, and what kind of sandbox they might build in collaboration. Part of JSTOR Labs’ philosophy values what Alex calls “multi-disciplinarity.” For example, JSTOR Labs’ partnership with Eigenfactor (which measures influential and highly cited articles) has resulted in a tool that helps scholars discover the most influential articles in a given field or topic area. JSTOR Labs also believes in hypothesis-driven development. Alex explained the key is ITERATING, ITERATING, INTERATING! Alex also presented the topic modeling examples, including Reimagining the Monograph, which started from JSTOR Labs asking, "Can we improve the experience and value of long-form scholarship?" The “topicgraph” provides a fingerprint of a monograph. Each term has a set of associated keywords, containment of which in the text make the probability higher that the term is being discussed. Last but certainly not least, Alex unveiled am amazing and brand new tool with the working name “Text Analyzer.” This tool is essentially a multi-language analyzer—text can be pulled from, say, a Russian Wikipedia entry. The tool will translate the text and list in English the topics included in the entry. Alex notes that so much of digital humanities is about probabilities, not known data. The label modelling that JSTOR Labs most frequently uses (as opposed to cluster topic modeling). The Philadelphia SSP Regional Meetings are an excellent venue to engage with the scholarly and scholarly publishing community. All are welcome. To learn more, click here! Copyright is far more than just a necessary evil to protect intellectual property from theft. Copyright furthers all creative interests by making the rich marketplace of ideas available to a wider audience. Resourceful rights and permissions management supports author content while maximizing the publisher’s budget. Hiring one person to perform all the rights and permissions functions requires finding a pretty special person: an editorial specialist with enough copyright expertise to be an IP strategist, while being a skilled digital-image savvy photo researcher and database manager. That's why we offer R&P as a service for publishers. Cenveo Publisher Services manages all aspects of text, image, and rich media content R&P. We assemble a team of project managers, assessment specialists, data entry staff, photo researchers, and permissions experts to support the management of R&P in your organization. By identifying a rights strategy early, authors can stay on budget. Research and permissions runs alongside production cycles with clearly defined milestones. Targeted international expertise also allows a spectrum of pricing options. Contact us to learn how we can support R&P for your journals or books program. A short video by John Bond at Riverwinds Consulting. John's YouTube channel, Publishing Defined, is a great resource for scholarly and academic publishers. The Association of American Publishers shared revenue figures in its StatShot report. Revenue growth is up 4.9% for Q1 2017 compared with Q1 2016. Both education and scholarly publishers experienced slight revenue bumps during the first quarter of 2017, compared with the first quarter of 2016. Higher Education course materials wins the greatest growth award, reporting $92 million (24.3%) increase to $470.2 million in Q1 2017 compared with the Q1 2016. Revenues for Professional Publishing (business, medical, law, scientific and technical books) were up by $5 million (4.5%) to $119.5 million. From the Association of American Publishers. The rise of digital STM publishing, and the ongoing discussion about open access and subscription-based models, has led some to conclude that these changes inexorably lead to lower overall publication costs. Reality is more complex. In my last blog, I discussed the open access or OA publishing model for scholarly, STM publishing. In a nutshell, OA allows peer-reviewed articles to be accessed and read without cost to the reader. Instead of relying on subscriptions, funding for such articles comes from a variety of sources, including article processing charges or APCs. There are many misconceptions about OA, including the mistaken notion that OA journals are not peer reviewed (false) and that authors typically pay APCs out of pocket (also false). However, a more serious problem occurs when we fail to account for all the costs of scholarly publishing—not just the obvious ones. The obvious publication costs of scholarly publishing—peer review, editing, XML transformation, metadata management, image validation, and so on—can be daunting. Part of the problem is the Internet itself. Search engines have given us the ability (in theory) to find information we need. Many non-scholarly publishers, particularly newspapers, have published content for anyone to read—in the misbegotten hope of selling more online advertising. The more idealistic among us have given many TED Talks on the virtue of giving away content, trusting that those who receive it—or at least some of then—will reciprocate. What may work for a rock band does not necessarily work in publishing, however. This is partly because publishing is a complex process, with many of its functions unknown to the average scholar or reader. The obvious publication costs of scholarly publishing—peer review, editing, XML transformation, metadata management, image validation, and so on—are daunting for anyone starting a new journal. If they want to be considered seriously, publications using the “Gold” open access model have to be able to handle these production costs over the long term. They also have to invest in other ways—to enhance their brand, and provide many of the services that scholars and researchers may take for granted. The first of these hidden costs is the handling of metadata. The OA publishing model—and digital publishing in general—resulted in an explosion of available content, including not only peer reviewed articles, but also the data on which they are based. Having consistent metadata is critical to finding any given needle in an increasing number of haystacks. Metadata is also the key that maintains updates to the research (think Crossref) and tracks errata. The trouble is that metadata is easy to visualize but it takes work and resources to implement well. Take for example the seemingly simple task of author name fields. The field for author surname (or family name, or last name) is typically text, but how does it accommodate non-Latin characters or accents? Does it easily handle the fact that surnames in countries like China are not the “last” name? The problem is usually not with the field itself, but with how it’s used in a given platform or workflow. Another hidden metadata cost is the emergence of standards, and how well each publishing workflow handles them. More recently, the unique author identifier (ORCID) has gained in prominence, but researchers and contributors may not automatically use them. There are many such metadata conventions—each representing a cost to the publisher, in order to let scholars focus on their work without undue publishing distractions. Another hidden cost is presentation. From simple, easy-to-read typography to complex visual elements like math formulae, the publisher’s role (and the corresponding cost) has expanded. What was once a straightforward typesetting and design workflow for print has expanded to a complex, rules-driven process for transforming Word documents and graphic elements into backend XML, which fuels distribution. The publishing model has drastically changed from a neatly-packaged “issue publication model” to a continuous publication approach. This new model delivers preprints, issues, articles, or abstracts to very specific channels. The systems and workflows that support the new publication model requires configuration and customization, which all have associated production costs. Very few publishers can maintain the production work required in house. Technology development, staffing, and innovation are costly to maintain. The solution is to rely on a trusted solutions provider, who performs such tasks for multiple journals. Typically, this involves the development of automated workflows—simplifying metadata handling and presentation issues, using a rules-based approach for all predictable scenarios. This of course relies on a robust IT presence—something a single publisher or group typically cannot afford alone. 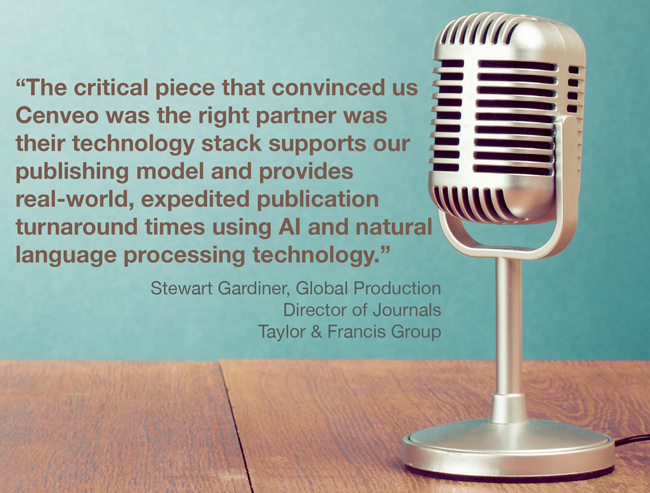 Ideally, automated workflows involve an initial setup cost, but will improve editorial quality, improve turnaround times, and speed up time to publication. By offloading the routine, data-intensive parts of publishing workflow to a competent service provider, publishers and scholars can spend more time on actual content and less time on the mechanics of making it accessible to and useable by other researchers. What are some of the "hidden costs" your organization finds challenging? John Bond of Riverwinds Consulting is creating a video library of useful shorts about topics and terms important to the STM publishing industry. For some people, his shorts may provide a great refresher or another take on subjects that impact our market. For those just starting their career in STM publishing, his video series should be required viewing! The series is titled "Publishing Defined" and covers a broad range of topics from defining specific terms to strategic advice regarding RFPs. Also helpful are the playlists he’s put together. You are sure to add a little something to your own knowledgebase from this series! The Crossmark playlist can be viewed here. Crossmark and Crossref are explained in our white paper, "All Things Connected." Download your copy today by clicking on the cover in the right column. It was another busy year at London Book Fair last week with reports of increased registration numbers up by a double-digit percentage. The following captured a brief quiet moment at the Cenveo Publisher Services Stand. The global team met with publishers, production managers, archivists, technology executives, and many others to discuss all things related to the creation and management of content. Indeed, the hot topic for LBF17 at the Cenveo Stand was content accessibility. Long a champion of digital equality, we're helping publishers create and architect content that is "born accessible." The same technologies and guidelines that improve access to materials for people with visual or hearing impairments, limited mobility, perceptual and cognitive differences, are also tremendously useful for all publishers' customers. No longer limited to education publishers, we see that journal publishers and others have a driving need to do more with content accessibility. Publishers Weekly covered a range of topics across the many markets represented at the Fair. Videos aid learning. Videos and animation are at the top of the elearning food chain. Whether it's within a traditional elearning course or as an independent asset, animated videos help learners visualize and understand complex concepts. 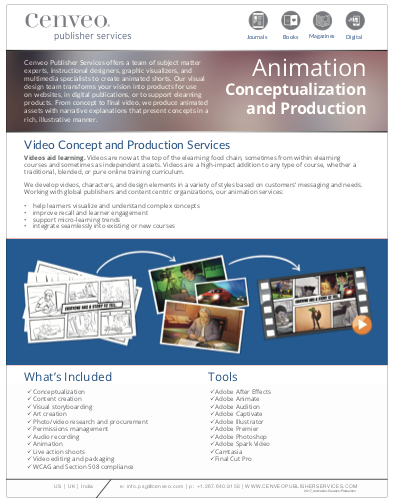 Increasingly, across all the markets we serve---journal publishers, K12 educational publishers, higher ed publishers, elearning providers, magazine publishers---all are interested in transforming complex content into animated video shorts. Have a look at an animated short we created to explain what a SWOT analysis is and why it's beneficial. Please provide a brief explanation of what your organization would like to do with animated shorts. We'll be in touch within 1 to 2 business days.